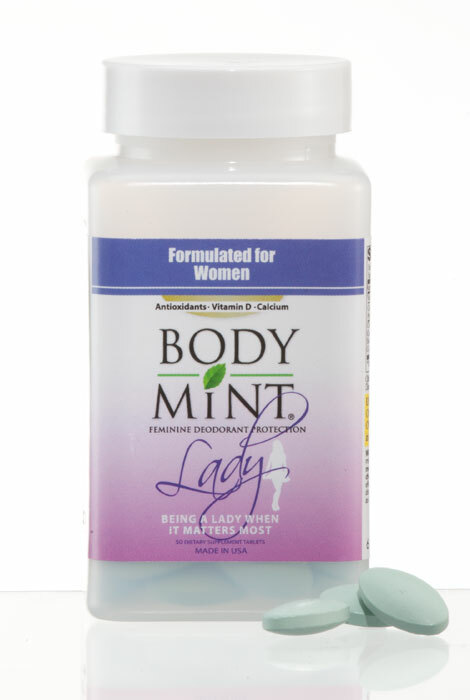 A woman needs a healthy alternative when it comes to feminine hygiene ... and that’s why we’re loving Body Mint Lady. Scientifically formulated to work with a woman’s body chemistry, it offers the added benefits of soothing lavender in a dietary supplement that works with your body to absorb odor-causing compounds before they’re even released. Say goodbye to embarrassing feminine odors and everyday body odors (underarm, breath, foot, perspiration) and indulge in cleansing antioxidants, high grade calcium and vitamin D, in a healthy supplement you’ll feel good about taking. No more uncomfortable washes, scented sprays or messy powders—a naturally fresh YOU has never been easier! Simply take 2 tablets daily for 24/7 protection. Includes 50 tablets. I ran out of this item and ordered more. I have used this in the past and wanted to get it again, it works! This item was referred to by a pharmacist. Hopefully to have nice feminine body fragrance. I ave tried something like it before and liked the results. I ordered this item because a friend said it works. Have used for a year now. Havre noticed a significant positive change. flashes which make you feel more secure in your personal hygiene! Want to try it. I work out a lot can get smelly at the gym. very good to have to maintain body odor. looking for. Thank you and have a great day. I WANT TO SEE IF IT WORKS. Does this product, Body Mint for women turn your urine green? I heard products like this may. BEST ANSWER: No, my urine has never been dis colored (and I've been using body mint for years) but my stools are definitely green. It works well? Any side effects besides what you mentioned earlier? No it does not. I haven taken it for a year or so. Thank you for your timely response. Would you be able to tell me if you are happy with the product?